Unique and contemporary design with rotating head. Six rounded coat hooks with four accessory pegs. 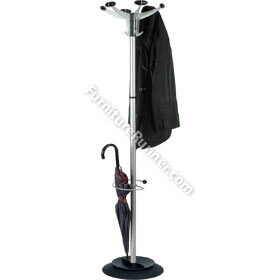 Integral umbrella holder with detachable water retainer. Stylish chrome finish with matt black pegs. Height: 1750mm, Base diameter: 380mm.